For other people with similar names, see Jo Cox (disambiguation). Helen Joanne Cox (née Leadbeater; 22 June 1974 – 16 June 2016) was a British politician who served as the Member of Parliament (MP) for Batley and Spen from her election in May 2015 until her murder in June 2016. She was a member of the Labour Party. Born in Batley, West Yorkshire, Cox studied Social and Political Sciences at Pembroke College, Cambridge. Working first as a political assistant, she joined the international humanitarian charity Oxfam in 2001, where she became head of policy and advocacy at Oxfam GB in 2005. She was selected to contest the Batley and Spen parliamentary seat after the previous incumbent, Mike Wood, decided not to stand in 2015. She held the seat for Labour with an increased majority. Cox became a campaigner on issues relating to the Syrian Civil War, and founded and chaired the all-party parliamentary group Friends of Syria. On 16 June 2016, Cox died after being shot and stabbed multiple times in Birstall, where she had been due to hold a constituency surgery. Thomas Mair, who held far-right views, was found guilty of her murder in November and sentenced to life imprisonment with a whole life order. Cox was born Helen Joanne Leadbeater on 22 June 1974 in Batley, West Yorkshire, England, to Jean, a school secretary, and Gordon Leadbeater, a toothpaste and hairspray factory worker. Raised in Heckmondwike, she was educated at Heckmondwike Grammar School, a state grammar school, where she was head girl. During summers, she worked packing toothpaste. Cox studied at Pembroke College, Cambridge, initially studying Archaeology and Anthropology before switching to Social and Political Science, graduating in 1995. She later studied at the London School of Economics. Following her graduation from Pembroke College, Cox worked as an adviser to Labour MP Joan Walley, before moving to Brussels to spend two years as an assistant to Glenys Kinnock, wife of former Labour leader Neil Kinnock, who was then a Member of the European Parliament. From 2001 to 2009, Cox worked for the aid groups Oxfam and Oxfam International, first in Brussels as the leader of the group's trade reform campaign, then as head of policy and advocacy at Oxfam GB in 2005, and head of Oxfam International's humanitarian campaigns in New York City in 2007. While there, she helped to publish For a Safer Tomorrow, a book authored by Ed Cairns which examines the changing nature of the world's humanitarian policies. Her work for Oxfam in which she met disadvantaged groups in Darfur and Afghanistan influenced her political thinking. Cox's charity work led to a role advising Sarah Brown, wife of former Prime Minister Gordon Brown, who was spearheading a campaign to prevent deaths in pregnancy and childbirth. Cox was the national chair of the Labour Women's Network and a senior adviser to the Freedom Fund, an anti-slavery charity. Cox was nominated by the Labour Party to contest the Batley and Spen seat being vacated by Mike Wood in the 2015 general election. She was selected as its candidate from an all-women shortlist. The Batley and Spen seat was a Conservative marginal between 1983 and 1997, but is now considered to be a safe seat for Labour, and Cox won the seat with 43.2% of the vote, increasing Labour's majority to 6,051. Cox made her maiden speech in the House of Commons on 3 June 2015, using it to celebrate her constituency's ethnic diversity, while highlighting the economic challenges facing the community and urging the government to rethink its approach to economic regeneration. She was one of 36 Labour MPs who nominated Jeremy Corbyn as a candidate in the Labour leadership election of 2015, but said she had done so to get him on the list and encourage a broad debate. In the election she voted for Liz Kendall, and announced after the local elections on 6 May 2016 that she and fellow MP Neil Coyle regretted nominating Corbyn. By refusing to tackle Assad's brutality, we may actively alienate more of the Sunni population, driving them towards Isis. So I have decided to abstain. Because I am not against airstrikes per se, but I cannot actively support them unless they are part of a plan. Because I believe in action to address Isis, but do not believe it will work in isolation. Andrew Grice of The Independent felt that she "argued forcefully that the UK Government should be doing more both to help the victims and use its influence abroad to bring an end to the Syrian conflict". In February 2016, Cox wrote to the Nobel Committee praising the work of the Syrian Civil Defense, a civilian voluntary emergency rescue organisation known as the White Helmets, and nominating them for the Nobel Peace Prize: "In the most dangerous place on earth these unarmed volunteers risk their lives to help anyone in need regardless of religion or politics". The nomination was accepted by the committee, and garnered the support of twenty of her fellow MPs and several celebrities, including George Clooney, Daniel Craig, Chris Martin and Michael Palin. The nomination was supported by members of Canada's New Democratic Party, who urged Stéphane Dion, the country's Foreign Affairs Minister, to give his backing on behalf of Canada. Cox, a supporter of the Labour Friends of Palestine & the Middle East, called for the lifting of the blockade of the Gaza Strip. She opposed efforts by the government to curtail the Boycott, Divestment and Sanctions movement, and said "I believe that this is a gross attack on democratic freedoms. Not only is it right to boycott unethical companies but it is our right to do so." Cox was working with Conservative MP Tom Tugendhat on a report to be published following the release of the Chilcot Report into the 2003 invasion of Iraq. After her death, Tugendhat wrote in The Times, "Our starting point was that while Britain must learn the painful lessons of Iraq, we must not let the pendulum swing towards knee-jerk isolationism, ideological pacifism and doctrinal anti-interventionism". With the charity Tell MAMA she worked on The Geography of Anti-Muslim Hatred, investigating cases of Islamophobia; the report was dedicated to her at its launch on 29 June 2016. Two parliamentary questions concerning the Yemeni Conflict, tabled by Cox to the Foreign Office on 14 June, were answered by Tobias Ellwood after her death. On 1 July, The Guardian reported that each answer was accompanied by a government note stating "This question was tabled before the sad death of the honourable lady but the subject remains important and the government's response ought to be placed on the public record." Cox was a "Remain" supporter in the campaign leading to the 2016 referendum on the United Kingdom's membership of the European Union. Following her death, the EU referendum campaign was suspended for the day by both sides as a mark of respect. The BBC cancelled editions of Question Time and This Week, two political discussion programmes scheduled to air that evening focussing on issues relating to the referendum. Cox was married to Brendan Cox, an adviser on international development to Gordon Brown during Brown's premiership, whom she met while she was working for Oxfam, from June 2009 until her death in June 2016. They had two children, Cuillin (b. 2011) and Lejla (b. 2012). The Cox family divided their time between their constituency home and a houseboat, a converted Dutch barge, on the Thames, moored near Tower Bridge in London. 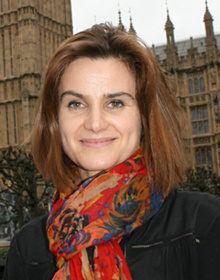 A secular humanist, Jo was a supporter of the British Humanist Association. At 12:53 pm BST on 16 June 2016, Cox was fatally shot and stabbed outside a library in Birstall, West Yorkshire, where she was about to hold a constituency surgery at 1:00 pm. According to eyewitnesses, she was shot three times — once near the head — and stabbed multiple times. A 77-year-old local man, Bernard Kenny, was stabbed in the stomach while trying to fend off her attacker. Initial reports indicated that the attacker, Thomas Mair, a 52-year-old Batley and Spen constituent who had a history of psychiatric problems, and links to the US-based neo-Nazi group National Alliance, shouted "Britain first" as he carried out the attack. The far-right Britain First party issued a statement denying any involvement or encouragement in the attack and suggested that the phrase "could have been a slogan rather than a reference to our party". Later at Mair's trial a witness stated that he shouted, "This is for Britain. Britain will always come first". Four hours after the incident, West Yorkshire Police announced that Cox had died of her injuries shortly after being admitted to Leeds General Infirmary. She was the first sitting MP to be killed since the Conservative Party's Ian Gow, who was killed by a Provisional IRA car bomb in July 1990, and the first MP to be seriously assaulted since Stephen Timms, who was stabbed by Roshonara Choudhry in an attempted assassination in May 2010. A memorial service was held at St Peter's Church in Birstall the following day. Mair was arrested shortly after the attack. In a statement issued the day after the attack, West Yorkshire Police said that Cox was the victim of a "targeted attack" and the suspect's links to far-right extremism were a "priority line of inquiry" in the search for a motive. On 18 June, Mair was charged with murder, grievous bodily harm, possession of a firearm with intent to commit an indictable offence and possession of an offensive weapon. He appeared at Westminster Magistrates' Court later that day, and at the Old Bailey on 20 June. On 23 November 2016, Mair was found guilty of all charges – the murder of Cox, stabbing Bernard Kenny (a charge of grievous bodily harm with intent), possession of a firearm with intent to commit an indictable offence and possession of an offensive weapon, namely the dagger. The trial judge said that the crime was so severe that 53-year-old Mair should be given a whole-life tariff—never be released from prison, except at the discretion of the Home Secretary. The assassination received worldwide attention with tributes and memorials for Cox being made with condemnation of Mair. A personal friend, Canadian MP Nathan Cullen paid tribute to Cox in the House of Commons of Canada. Canadian Prime Minister Justin Trudeau, former US Secretary of State Hillary Clinton, the then US Secretary of State John Kerry and former US Representative Gabrielle Giffords, who was wounded in an assassination attempt in 2011, were among international politicians who sent messages of condemnation and sympathy in the aftermath of her killing. Cox's husband issued a statement urging people to "fight against the hatred that killed her". Among those who paid tribute to Cox were Labour Party leader Jeremy Corbyn, who described her as someone who was "dedicated to getting us to live up to our promises to support the developing world and strengthen human rights", while Prime Minister David Cameron said she was "a star for her constituents, a star in parliament, and right across the house". US President Barack Obama telephoned Cox's husband to offer his condolences, noting that "the world is a better place because of her selfless service to others". Parliament was recalled on 20 June 2016 for fellow MPs to pay tribute to Cox. The day after Cox died, 17 June 2016, her husband set up a GoFundMe page named "Jo Cox's Fund" in aid of three charities which he described as "closest to her heart": the Royal Voluntary Service, Hope not Hate, and the White Helmets, a Syrian civil defence group. £700,000 had been raised by 19 June 2016, with the amount exceeding £1 million by the following day. On 20 June, Oxfam announced it would release Stand As One – Live at Glastonbury 2016, an album of live performances from the festival in memory of Cox and that proceeds from the album, released on 11 July, will go towards the charity's work with refugees. The festival opened with a tribute to Cox. On the evening of 23 June, while ballots were being counted in the EU membership referendum, polling officials in the Yorkshire and Humber region observed a minute's silence. West Yorkshire coroner Martin Fleming opened an inquest into Cox's death at Bradford Coroner's Court on 24 June. It was adjourned following a six-minute hearing and her body released to allow her family to make funeral arrangements. The funeral, "a very small and private family affair", was held in her constituency on 15 July, with many thousands of people paying their respects as the cortege passed. A by-election in Batley and Spen was held on 20 October 2016. Labour candidate Tracy Brabin, an actress whose credits include a role in Coronation Street in the mid 1990s, won the by-election with 85 percent share of the vote. The Conservative Party, Liberal Democrats, Green Party, and UKIP did not contest the election as a mark of respect. Jack Buckby caused widespread condemnation by standing in the by-election, with Cox's former Labour colleague MP Jack Dromey describing Liberty GB's bid as "obscene, outrageous and contemptible". One year after her murder, three individuals who came to her aid were honoured in the 2017 Queen's Birthday Honours. Bernard Kenny, a passerby who tried to stop Mair during the attack and was himself stabbed in the stomach, was awarded the George Medal, which is given to civilians who exhibit great bravery. PC Craig Nicholls and PC Jonathan Wright of the West Yorkshire Police, who apprehended and arrested her attacker after he had fled the scene, were awarded the Queen's Gallantry Medal. In December 2016, a group of politicians came together to record a cover of the Rolling Stones "You Can't Always Get What You Want" in honour of Cox. Politicians from the Labour Party, the Conservatives, and the SNP joined with members of the Parliament Choir, the Royal Opera House Thurrock Community Chorus, musician KT Tunstall, Steve Harley, Ricky Wilson, David Gray and other musicians. All profits from sales of the song went to the Jo Cox Foundation. In May 2017, a memorial, designed by Cox's children, was unveiled in the House of Commons. The unveiling took place at the first "Great Get Together" event that the Jo Cox Foundation held and was in the form of a family day at Parliament. In June 2017, Cox's husband Brendan published Jo Cox: More In Common, a book that talks about the impact of his wife's death on their family. Also in June 2017, and to mark the first anniversary of Cox's death, her family and friends urged people to take part in a weekend of events to celebrate her life and held under the banner of "The Great Get Together"; events included picnics, street parties and concerts. A street, formerly Rue Pierre–Étienne Flandin after Pierre-Étienne Flandin, in Avallon, a town in the Yonne département of France, was renamed Rue Jo Cox in May 2017. In Brussels, a square beside the Ancienne Belgique concert hall was renamed to Place Jo Cox / Jo Cox Plein in September 2018. A work of contemporary dance theatre inspired by Jo Cox's political and social beliefs, entitled More in Common, was created by Youth Music Theatre UK in August 2017 and presented at the Square Chapel, Halifax. On 24 June 2017, a coat of arms, designed with the input of Cox's children, was unveiled by her family at the House of Commons, where MPs killed in office are honoured with heraldic shields. The elements of the arms included four roses, to symbolize the members of Cox's family (two white roses, for Yorkshire, and two red, for Labour); and the tinctures green, purple, and white, which were the colours of the British suffragette movement. The motto, "More in Common," is displayed below the shield, and comes from her maiden speech made in Parliament, in which she said, "We are far more united and have far more in common than that which divides us." Barry wavy Vert and Purpure a Chevronel Argent between in chief a White Rose and a Red Rose proper both barbed seeded and slipped the stalks conjoined Or and in base a Red Rose and a White Rose proper both barbed seeded and slipped the stalks conjoined Or. Nigel Jones, Baron Jones of Cheltenham – MP who, in 2000, was wounded in a sword attack at his advice surgery by a constituent he had previously tried to help; his aide Andrew Pennington was killed. ^ "No. 61230". The London Gazette. 18 May 2015. p. 9119. ^ a b "Batley & Spen Parliamentary constituency". BBC News. 8 May 2015. Archived from the original on 8 May 2015. Retrieved 8 May 2015. ^ "MP Jo Cox died from 'multiple stab and gunshot wounds'". BBC News. 24 June 2016. Archived from the original on 27 June 2016. Retrieved 6 July 2016. ^ "Man jailed for life for murdering MP Jo Cox". BBC News. 23 November 2016. Archived from the original on 23 November 2016. Retrieved 23 November 2016. ^ Cobain, Ian; Taylor, Matthew (23 November 2016). "Far-right terrorist Thomas Mair jailed for life for Jo Cox murder". The Guardian. Retrieved 17 June 2018. ^ a b Carr, Tim; Dale, Iain; Waller, Robert (18 May 2015). The Politicos Guide to the New House of Commons 2015: Profiles of the New MPs and Analysis of the 2015 General Election Results. Biteback Publishing. ISBN 9781849549240. Archived from the original on 5 February 2017. ^ a b c "Jo Cox profile: The Yorkshire lass who achieved her 'dream' of representing her hometown in Westminster". The Daily Telegraph. Retrieved 16 June 2016. ^ Langdon, Julia (16 June 2016). "Jo Cox obituary". The Guardian. Archived from the original on 10 January 2017. Retrieved 11 January 2017. ^ Tompkins, Louise (16 June 2016). "Jo Cox MP (1974-2016)". Pembroke College, Cambridge. Archived from the original on 23 June 2016. Retrieved 29 November 2017. ^ a b c d e f "Jo Cox obituary: Proud Yorkshire lass who became local MP". BBC News. 16 June 2016. Archived from the original on 17 June 2016. Retrieved 16 June 2016. ^ a b c d Boyle, Danny (16 June 2016). "Labour MP Jo Cox dies after being shot and stabbed in her constituency near Leeds". The Daily Telegraph. Archived from the original on 16 June 2016. Retrieved 16 June 2016. ^ "Jo Cox MP: 'A humanitarian with political nous'". BBC News. BBC. 17 June 2016. Archived from the original on 21 June 2016. Retrieved 25 June 2016. ^ Hope, Christopher (10 June 2014). "Oxfam: MPs shocked by 'disgraceful' political campaigning". The Daily Telegraph. Archived from the original on 9 October 2015. Retrieved 11 October 2015. ^ Martin, Shaw (12 May 2014). "Women's campaigner Jo Cox chosen as Labour candidate to fight next General Election in Batley & Spen". Huddersfield Daily Examiner. Archived from the original on 8 May 2016. Retrieved 6 May 2016. ^ Shaw, Martin (12 May 2014). "Women's campaigner Jo Cox chosen as Labour candidate to fight next General Election in Batley & Spen". Huddersfield Daily Examiner. Archived from the original on 16 June 2016. Retrieved 16 June 2016. ^ Castle, Stephen; Bock, Pauline (16 June 2016). "Jo Cox, Member of British Parliament, Is Killed in Attack". The New York Times. Archived from the original on 16 June 2016. Retrieved 16 June 2016. ^ "Devolution And Growth Across Britain". Hansard. 3 June 2015. Archived from the original on 18 June 2016. Retrieved 17 June 2016. ^ "Maiden speech made by new MP Cox before nominating Corbyn". Batley & Birstall News. 19 June 2015. Archived from the original on 26 June 2016. Retrieved 16 June 2016. ^ Grice, Andrew; Wright, Oliver (10 September 2015). "Labour moderates plot fightback aimed at regaining control of party in the event of Jeremy Corbyn victory". The Independent. Archived from the original on 24 April 2016. Retrieved 6 May 2016. ^ Cox, Jo; Coyle, Neil (6 May 2016). "We nominated Jeremy Corbyn for the leadership. Now we regret it". The Guardian. Archived from the original on 20 May 2016. Retrieved 6 May 2016. ^ a b c "'I've been in some horrific situations' – MP". Yorkshire Post. 26 December 2015. Archived from the original on 16 June 2016. Retrieved 1 June 2016. ^ Mitchell, Andrew; Cox, Jo (11 October 2015). "British forces could help achieve an ethical solution in Syria". The Observer. Archived from the original on 16 October 2015. Retrieved 11 October 2015. ^ Helm, Toby; Boffey, Daniel (10 October 2015). "More than 50 Labour MPs to defy Jeremy Corbyn in vote on Syria". The Guardian. Archived from the original on 24 June 2016. Retrieved 1 June 2016. ^ Proctor, Kate (12 February 2016). "Jo Cox: Syrian ceasefire tipped in President Assad and Russia's favour". Yorkshire Post. Archived from the original on 15 August 2016. Retrieved 1 June 2016. ^ Cox, Jo (2 December 2015). "With Regret, I Feel I Have No Other Option But to Abstain on Syria". The Huffington Post. Archived from the original on 7 April 2016. Retrieved 6 May 2016. ^ "Jo Cox obituary: The Labour MP who campaigned tirelessly for refugees". The Independent. 16 June 2016. Archived from the original on 16 June 2016. Retrieved 16 June 2016. ^ Ensor, Josie (15 September 2016). "MP Jo Cox's heartfelt plea for Syrian 'heroes' to receive Nobel Prize shortly before her death". The Daily Telegraph. Telegraph Media Group. Archived from the original on 16 September 2016. Retrieved 17 September 2016. ^ Cullen, Catherine (15 September 2016). "NDP pushes for Syrian 'White Helmets' to win Nobel Peace Prize". CBC News. CBC. Archived from the original on 18 September 2016. Retrieved 19 September 2016. ^ "Parliamentary supporters". Labour Friends of Palestine & the Middle East. Archived from the original on 13 June 2016. Retrieved 17 June 2016. ^ "Making the progressive case for peace in Palestine and Israel: Labour Party policies to support the rule of law and human rights" (PDF). Labour Friends of Palestine & the Middle East. December 2015. pp. 10–12. Archived (PDF) from the original on 5 July 2016. Retrieved 17 June 2016. ^ Cox, Jo (17 February 2016). "Have your say: Israel boycott ban". jocox.org.uk. Archived from the original on 17 June 2016. Retrieved 17 June 2016. ^ "MP Tom Tugendhat worked with 'murdered' Jo Cox on Iraq war report". Kent Messenger. KM Group. 8 July 2016. Archived from the original on 8 July 2016. Retrieved 9 July 2016. ^ "Report dedicated to Jo Cox shows 326 per cent rise in anti-Muslim incidents". ITV News. ITV. 29 June 2016. Archived from the original on 10 July 2016. Retrieved 9 July 2016. ^ "Government answers Jo Cox's final questions on children in war zones". The Guardian. Guardian Media Group. 1 July 2016. Archived from the original on 6 July 2016. Retrieved 9 July 2016. ^ "EU vote: Where the cabinet and other MPs stand". BBC News. 14 June 2016. Archived from the original on 3 October 2017. Retrieved 16 June 2016. ^ Goodacre, Kate (16 June 2016). "Question Time and This Week cancelled by BBC following the tragic death of Jo Cox MP". Digital Spy. Archived from the original on 16 June 2016. Retrieved 16 June 2016. ^ Lewis, Helen (16 June 2016). "EU campaigning suspended following death of Jo Cox MP". New Statesman. Progressive Media International. Archived from the original on 17 June 2016. Retrieved 17 June 2016. ^ Sims, Alexandra (16 June 2016). "Jo Cox dead: MP's husband Brendan Cox says wife was killed by 'hate'". The Independent. Archived from the original on 16 June 2016. Retrieved 16 June 2016. ^ "Husband posts picture on Twitter of MP wife outside their houseboat". The Daily Telegraph. 16 June 2016. Archived from the original on 16 June 2016. Retrieved 16 June 2016. ^ a b Cox, Brendan (2017). Jo Cox: More in common. Two Roads. ISBN 978-1-473-65918-6. ^ "Jo Cox MP". British Humanist Assication. Archived from the original on 17 January 2018. Retrieved 29 September 2016. ^ a b Booth, Robert; Dodd, Vikram; Parveen, Nazia (16 June 2016). "Labour MP Jo Cox has died after being shot and stabbed". The Guardian. Archived from the original on 16 June 2016. Retrieved 16 June 2016. ^ Pidd, Helen (17 June 2016). "Suspect in Jo Cox's killing described as quiet, polite and reserved". The Guardian. Archived from the original on 18 June 2016. Retrieved 18 June 2016. ^ Pogatchnik, Shawn; Lawless, Jill (17 June 2016). "Police probe far-right ties, mental health in Jo Cox slaying". Associated Press. Archived from the original on 17 June 2016. Retrieved 17 June 2016. ^ Hartley-Parkinson, Richard (16 June 2016). "MP Jo Cox shot outside Birstall library by man shouting 'Britain First'". Metro. Archived from the original on 16 June 2016. Retrieved 16 June 2016. Britain First obviously is not involved and would never encourage behaviour of this sort. ^ Boyle, Danny (16 June 2016). "Britain First party leader 'just as shocked as everyone else'". The Daily Telegraph. Archived from the original on 16 June 2016. Retrieved 16 June 2016. Jo Cox is obviously an MP campaigning to keep Britain in the EU so if it was shouted by the attacker it could have been a slogan rather than a reference to our party – we just don't know. ^ "Labour MP Jo Cox 'murdered for political cause'". BBC News. 14 November 2016. Archived from the original on 14 November 2016. Retrieved 14 November 2016. ^ "Jo Cox MP dead after shooting attack". BBC News. 16 June 2016. Archived from the original on 16 June 2016. Retrieved 16 June 2016. ^ Calamur, Krishnadev; Vasilogambros, Matt (16 June 2016). "The Attack on a British MP". The Atlantic. Archived from the original on 16 June 2016. Retrieved 16 June 2016. As our colleague Matt Ford notes, Cox is the first MP to be assassinated in office since Ian Gow, a Conservative lawmaker who was killed in a car bombing by the Irish Republican Army in 1990. ^ Siddique, Haroon (16 June 2016). "Attack on Jo Cox is only the latest serious assault against an MP". The Guardian. Archived from the original on 16 June 2016. Retrieved 16 June 2016. ^ Nicks, Denver (16 June 2016). "Assassinated British MP Was a Vocal Humanitarian". Time. Archived from the original on 17 June 2016. Retrieved 16 June 2016. ^ "Jo Cox MP death: David Cameron and Jeremy Corbyn unite in tributes". BBC News. 17 June 2016. Archived from the original on 17 June 2016. Retrieved 17 June 2016. ^ Foster, Patrick; Mendick, Robert; Wilkinson, Michael (16 June 2016). "Thomas Mair: Man arrested in connection with Jo Cox attack was a 'loner' with 'history of mental health problems'". The Daily Telegraph. Archived from the original on 17 June 2016. Retrieved 17 June 2016. ^ Castle, Stephen (17 June 2016). "Suspect in British Lawmaker's Killing Is Said to Have Neo-Nazi Ties". The New York Times. Archived from the original on 18 June 2016. Retrieved 17 June 2016. ^ Booth, Robert; Dodd, Vikram (17 June 2016). "Jo Cox killing: suspect's far-right links a 'priority line of inquiry'". The Guardian. Archived from the original on 17 June 2016. Retrieved 17 June 2016. ^ Booth, Robert (17 June 2016). "Thomas Mair charged with murder of MP Jo Cox". The Guardian. Archived from the original on 18 June 2016. Retrieved 17 June 2016. ^ "Jo Cox MP death: Thomas Mair in court on murder charge". BBC News. 18 June 2016. Archived from the original on 18 June 2016. Retrieved 18 June 2016. ^ "Jo Cox: Man jailed for 'terrorist' murder of MP". BBC News. 23 November 2016. Archived from the original on 25 November 2016. Retrieved 26 November 2016. ^ "Canadian MP breaks down in Jo Cox tribute". Archived from the original on 21 June 2016. Retrieved 6 July 2016. ^ "Worldwide tributes flow in after Jo Cox MP's shocking death". The Daily Telegraph. Archived from the original on 26 June 2016. Retrieved 6 July 2016. ^ "Jo Cox death: Husband leads tributes to shot MP". BBC News. 16 June 2016. Archived from the original on 17 June 2016. Retrieved 16 June 2016. ^ John, Tara. "Tributes Pour in for Jo Cox Following British MP's Death". Time. Archived from the original on 17 June 2016. Retrieved 16 June 2016. ^ "Jo Cox MP: 'We've lost a bright star' says Cameron". BBC News. Archived from the original on 16 June 2016. Retrieved 16 June 2016. ^ "Obama Makes Phone Call To Jo Cox's Husband". Sky News. 18 June 2016. Archived from the original on 18 June 2016. Retrieved 18 June 2016. ^ "Jo Cox death: MPs return to Parliament to pay tribute". BBC News. 20 June 2016. Archived from the original on 20 June 2016. Retrieved 20 June 2016. ^ "Jo Cox remembered at Sunday church services nationwide". ITV News. ITN. 19 June 2016. Archived from the original on 20 June 2016. Retrieved 20 June 2016. ^ "Jo Cox's Fund". gofundme.com/jocox. GoFundMe. Archived from the original on 19 June 2016. Retrieved 20 June 2016. ^ Quinn, Ben (20 June 2016). "Jo Cox memorial fund passes £1m mark in three days". The Guardian. Guardian Media Group. Archived from the original on 21 June 2016. Retrieved 21 June 2016. ^ Payne, Chris (20 June 2016). "Coldplay, Muse, Chvrches & More to Tribute Jo Cox With Glastonbury Live Album". Billboard. Archived from the original on 21 June 2016. Retrieved 21 June 2016. ^ "Glastonbury live album to be dedicated to Jo Cox MP". BBC News. BBC. 21 June 2016. Archived from the original on 21 June 2016. Retrieved 21 June 2016. ^ "Glastonbury Festival has sombre opening". BBC News. BBC. 24 June 2016. Archived from the original on 24 June 2016. Retrieved 24 June 2016. ^ "Counting stops for minute silence for Jo Cox". The Daily Telegraph. 24 June 2016. Archived from the original on 24 June 2016. Retrieved 24 June 2016. ^ Parveen, Nazia (24 June 2016). "Body of MP Jo Cox released to family for funeral". The Guardian. Guardian Media Group. Archived from the original on 24 June 2016. Retrieved 24 June 2016. ^ "Jo Cox funeral will be small and private affair, say family". The Guardian. Guardian Media Group. 11 July 2016. Archived from the original on 11 July 2016. Retrieved 12 July 2016. ^ Pidd, Helen (15 July 2016). "Jo Cox funeral brings thousands of mourners on to streets". The Guardian. Archived from the original on 15 July 2016. Retrieved 15 July 2016. ^ "Tories retain Witney and Labour holds Batley and Spen in byelections". The Guardian. 21 October 2016. Archived from the original on 21 October 2016. Retrieved 21 October 2016. ^ "Former BNP member to contest Jo Cox's seat in by-election". The Times. 19 June 2016. ^ "Anti-Islam Politician Rejects Other Parties' Gesture of Respect, Vies for Slain MP's Seat". Haaretz. 20 June 2016. Archived from the original on 1 December 2017. ^ Simpson, Fiona (17 June 2017). "Man stabbed as he fought to save Jo Cox celebrated in honours list". Evening Standard. Archived from the original on 15 September 2017. Retrieved 15 September 2017. ^ "Queen's Birthday Honours". www.westyorkshire.police.uk. West Yorkshire Police. 17 June 2017. Archived from the original on 15 September 2017. Retrieved 15 September 2017. ^ "Who's behind the Jo Cox charity single? Plus, everything else you need to know". The Daily Telegraph. Archived from the original on 7 June 2017. Retrieved 2 May 2017. ^ "Jo Cox memorial to be unveiled in the House of Commons next month by her two young children". The Daily Telegraph. Archived from the original on 22 April 2017. Retrieved 2 May 2017. ^ Aitkenhead, Decca (3 June 2017). "Brendan Cox: 'It would be easy to be consumed by fury and hatred and bile'". The Guardian. Guardian Media Group. Archived from the original on 3 June 2017. Retrieved 3 June 2017. ^ "Jo Cox's son made up a song in her memory after she was killed". BBC News. BBC. 3 June 2017. Archived from the original on 3 June 2017. Retrieved 3 June 2017. ^ "Events held to remember murdered MP Jo Cox". BBC News. BBC. 16 June 2017. Archived from the original on 16 June 2017. Retrieved 16 June 2017. ^ Gacon, Armelle. "Inauguration - Une rue Jo Cox à Avallon en hommage à la députée britannique assassinée en 2016". L'Yonne républicaine. Archived from the original on 30 November 2017. Retrieved 26 November 2017. ^ Sparrow, Andrew; O'Carroll, Lisa; Carrell, Severin (27 September 2018). "Jo Cox square unveiled in Brussels in memory of murdered MP - Politics live". The Guardian. ISSN 0261-3077. Retrieved 27 September 2018. ^ "Brussels renames square in honour of murdered MP Jo Cox". The Independent. Retrieved 28 September 2018. ^ "More in Common - Youth Music Theatre UK". Youth Music Theatre UK. 14 December 2017. Retrieved 28 September 2018 – via YouTube. ^ "Jo Cox MP honoured with Commons plaque". BBC News. BBC. 24 June 2017. Archived from the original on 24 June 2017. Retrieved 24 June 2017. ^ Morrison, Sam (24 June 2017). "Jo Cox's children unveil memorial plaque for murdered MP". Evening Standard. Archived from the original on 15 September 2017. Retrieved 15 September 2017. ^ "Jo Cox MP". Heraldry Online. 16 July 2017. Archived from the original on 26 August 2017. Retrieved 25 August 2017. ^ "July 2017 Newsletter (no. 51)". College of Arms. Archived from the original on 5 August 2017. Retrieved 5 August 2017.